We cover all the key venues in Amsterdam and beyond; as individuals or as a team. 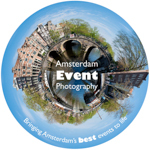 Add videography and real time social media coverage possibilities and Amsterdam Event Photography has every base covered. You’ll find we have special experience of Tech, Pharmaceutical, Medical, Educational & Finance conferences.